There are lots of GPS yardage devices on the market and Callaway Golf’s latest is a top choice for those wanting all the features it provides. The upro mx+ golf GPS device carries a hefty price of $249 but has hole by hole video flyovers and aerial images that provide clear, accurate views in addition to showing distance to key places. It comes with unlimited course downloads at no cost in contrast to some devices with annual fees and per course charges. 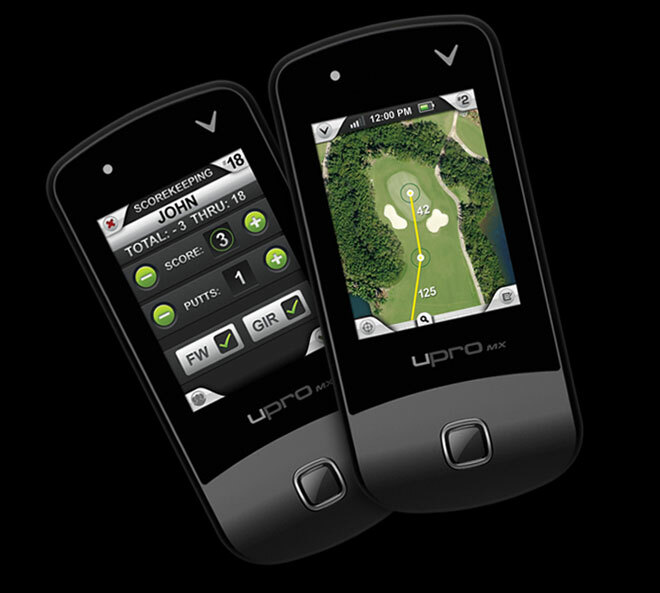 The upro mx+ weighs in at 3-ounces and has a 2.2 inch LCD touch screen with what the company calls Anypoint Technology which gives yardage to any selected point and also the yardage left from that point to the green. There’s a scorecard feature with a stats package built in to the software making a very nice and useful package allowing uploading to the recordkeeping uxplore web site. Additionally, a digital scorecard allows golfers to track their scores and basic golf stats on the device, including fairways hit, greens in regulation and putts during each round. Out of the box the upro mx+ is ready to use with 25,000 courses preloaded with showing yardage and hazard data plus illustrations of greens. The aerial images and video flyovers can be downloaded with no cost.